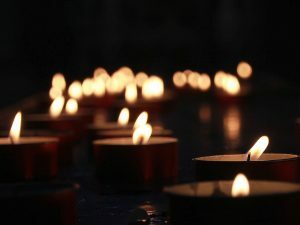 Tomorrow, October 4, is the annual Sisters in Spirit Vigil. This is a day to honour and remember Murdered and Missing Indigenous Women, Girls, Two-Spirit, and gender-diverse people; those we have lost to ongoing colonial and misogynistic violence across Turtle Island (otherwise known as North America). Rates of violence against women in BC remain a serious concern as highlighted by West Coast LEAF’s 2017 CEDAW Report Card. The statistics show that girls and women in every age group are more likely to be victims of family violence in comparison to boys and men. Victim services in BC reported that about four out of five (81%) direct victims served were female-identified. In looking at statistics it is vital to approach these numbers with a critical eye to try and understand what is being obscured. What the data asks and doesn’t ask, what identities, like those who are non-binary, are erased? However, a picture does begin to develop. When we look more deeply at the available statistics we see the relationships between misogyny and colonialism: “between 2000 and 2008, Aboriginal women and girls represented approximately 10% of all female homicides in Canada.” What does this tell us as a society when Indigenous women and girls only make up 3% of the female-identified population? Knowing how to confront and push back on this violent reality is at times overwhelming and can leave me feeling immobilized. It is in these moments that I rely on teachings shared with me by my mentors and community around the importance of centring our stories. Indigenous knowledge lives in our stories. I have heard many times from Elders that we have one mouth and two ears for a reason. The time is well overdue that we do much more listening to Indigenous people and our communities. Our first action must be to ground ourselves in the knowledge and teachings of Indigenous People as they are offered to us and allow this to guide our actions. [W]e are striving to become story-listeners and centre Indigenous voices. This means we must work collectively to keep these stories alive as our teachers. This means hearing and deeply listening to the stories about the violent colonial system that continues to oppress Indigenous people, knowledge, and experiences. We must become familiar and knowledgeable about the stories of the Indian Act, Reserves, Residential Schools, Indian Hospitals, child welfare system, justice system, and all other spaces colonialism continues to harm Indigenous communities. We must become equally familiar and closely acquainted with the stories from Indigenous people that carry forward the teachings of how to live in a good way. The stories of raising up strong Indigenous children. 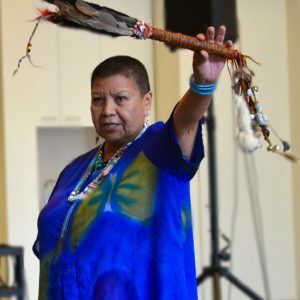 Stories honouring our Matriarchs, Two-Spirit people, intersex people, gender non-conforming people, trans people, and people with non-binary gender identities. Stories of resisting the colonial project and stories of revitalizing knowledge that has been hidden. These stories are wise teachers that can build a roadmap for all of us. At West Coast LEAF these stories guide us to honour our commitment to Reconciliation and Decolonization by committing to hearing and engaging with stories each month. Here in circle, we are striving to become story-listeners and to centre Indigenous voices. 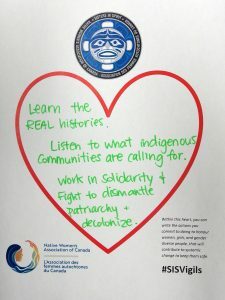 These are just first steps in a lifelong journey of growing our skills and understandings to become better allies with Indigenous women, girls, Two-Spirit people, intersex people, gender non-conforming people, trans people, and people with non-binary gender identities and communities. Our work is ongoing and tomorrow we will honour those we have lost and extend our deepest gratitude to the families, leaders and communities leading the fight for change. Sharnelle Jenkins-Thompson is a proud mixed woman raised by a Welsh-Jewish immigrant Mum and a Metis-Cree father. She is the Manager of Community Outreach at West Coast LEAF. Sharnelle is passionate about addressing the impacts of colonialism and injustice through the power of meaningful relationships. Sharnelle grew up in Nanaimo (Snuneymuxw Nation) but now calls Vancouver home. She is a student at UVic in the Masters of Indigenous Social Work program. She often can be found hanging out with her tortoise and cat and enjoying this beautiful, unceded Coast Salish Territory.